Microsoft says that yes, you can plug a PlayStation 4 into the Xbox One's HDMI port, but it would really rather you didn't. Speaking at the Tokyo Game Show last week, Albert Penello, the senior director of product management and planning for the Xbox, declined to directly answer the question of whether the Xbox One would support a video feed from a PlayStation 4 through its HDMI port - but he did say later on, while talking about the console's ability to "snap" applications to the side of the screen, that "any application can be snapped to a game... this could be the live TV feed, so if you wanted to be playing Ryse and Killzone at the same time, you could snap that." Killzone, of course, is a PlayStation-exclusive franchise, so that seemed to be that, and in a follow-up post on NeoGAF Penello confirmed that the Xbox One will in fact pass a PS4 signal through its HDMI port - but added that he doesn't think it's a good idea. "I'll get back with a more detailed story, but long story short it won't be a great experience, and I indicated as much in the interview which wasn't included. HDMI latency is fine for video feeds, but not great interactive," he wrote. "Its also funny to me that this was basically a quick question I was asked after a UI demo, which I answered, but its written like I made a big deal about it..."
Does that sound reasonable? I'm asking honestly, because I don't know - it strikes me as a bit of a dubious proposition, but my experience in such things is limited to passing a TRS-80 through a VCR back in the day. 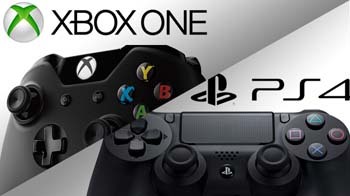 We'll find out the moment both consoles are available, because you just know that as soon as it can be done, it will be done, but in the meantime, what do you think?